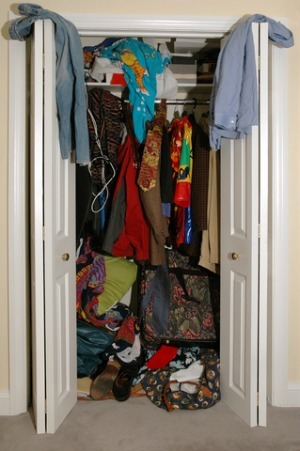 Don't let home buyers find overflowing closets like this! Declutter your closets and stage them to create the illusion of more space in your home. Prospective home buyers will be looking for spacious closets in your home and plenty of them. Let’s face it, there is never enough storage space in our homes and most of us would be embarrassed to have others look inside our closets. Most people organize their closets every few years, so that’s a lot of time for stuff to accumulate and get out of control. Once the closet door is shut, we tend to forget about the mess inside. That teetering stack of boxes on the top shelf is a potential avalanche just waiting to happen! Maybe it's time to declutter your closets and have a yard sale? Home buyers will be looking inside all your closets to see if there is enough room for their stuff. They WILL open every door! Cluttered and overstuffed closets are a red flag to home buyers-- they will think the rest of the house is too small and lacking in storage space. On the other hand, neat and organized closets, even small ones, will certainly impress home buyers. Read on for some decluttering and home staging tips that will make your closets look more spacious and organized. Declutter your closets by gathering up boxes, totes, garbage bags, permanent marker and tape. Label your boxes; keep, mend, donate, yard sale, or throw away. Pull everything out of the closet. Take this opportunity to dust, vacuum, scrub, and maybe paint the inside of the closet. If closets are really dark inside, paint the interior white, or a pale neutral paint color. Adding a lighting fixture to the closet interior will make it more appealing to buyers. If your closet needs interior lighting, install some inexpensive battery-operated stick-on light pucks, such as the Sylvania Dot-it Silver LED Stick-On Tap Light. One light uses 3 AAA batteries and provides up to 100 hours of light with just a tap. These handy little lights are a less expensive alternative for under-cabinet lighting in your kitchen as well. You can find stick-on light pucks at Home Depot, Lowes, and most home supply stores. This is your opportunity to get a head start on your packing. Out-of-season clothing, such as bulky coats and winter boots; pack away for your new home or save for your yard sale. Donate or toss out the items you don’t plan to keep. For clothing that needs repairing, give yourself two weeks to mend them. If at the end of that time you still haven’t fixed them, throw them out. Your closet should be clean and empty. Now is a good time to determine if your closet could use a closet organization system. Do you have enough room to install another rod for more hanging space? Is there room for more shelving? How about a rack to organize your shoes? Is there an area inside or on the back of your closet doors where you could install hooks for hanging belts, purses or robes? 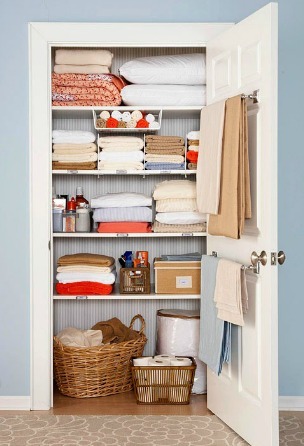 Go to your local home supply store and look at ready-made closet organizers. There are so many inexpensive options to choose from. 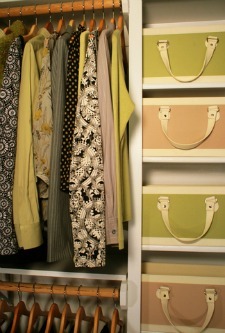 Home buyers LOVE closet organizer systems! You can also find a huge selection of closet organizing systems on Amazon.com or overstock.com. Take advantage of the vertical space in your closet. Maximize closet storage by going all the way from the floor up to the ceiling. If you plan on storing folded items like sweaters and jeans, try placing them in see-through bins to keep them looking neat and organized. Coordinating hat boxes and baskets will look very attractive on your shelves and will surely impress home buyers. This color-coordinated closet is sure to impress buyers! Sort clothing by color. When you are ready to hang your apparel back in the closet, arrange it in beautiful blocks of color. You'll want to stage your closet with matching hangers. Buy some inexpensive, but sturdy plastic hangers ALL in the same color. Don't use wire hangers. Not only do they look bad, they'll stretch out the shoulders on your clothing. If you can afford it, wood hangers look especially nice and serve as multi-function hangers as well. Clear plastic hangers with strap holders will protect your clothing and keep shirts from sliding off. Hangers made specifically for pants will keep trousers from creasing and slipping off. Try "huggable hangers," which take up less room and will keep clothes from slipping off. Huggable hangers can be found at Amazon and containerstore.com. Be sure that all hangers are pointing in the same direction. Don't cram clothing together! Space hangers a thumb's width apart. It doesn’t matter how small your closet is-- this spacing tip is important in creating the illusion that your closet is bigger than it is. Home buyers will love the way your closet looks! Even if they don't buy your home, they'll be sure to go home and reorganize their own closets in the same fashion. Watch the video by askthedecorator for diy tips on organizing and staging your closet. Leaving spaces between items gives the impression that the closet has room to spare! Utility, craft, clothing, and linen closets should all have the same thing in common. Keep your closets organized by placing RELATED items together. Don’t store Christmas decorations or office supplies in the same closet as your vacuum cleaner, mops and brooms. If you're like me, you will quickly forget where you put everything. For home staging purposes, your holiday decorations should be packed away for your new home unless you are selling your house during this holiday. 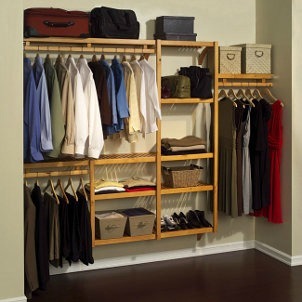 NOTE: After your closets are looking gorgeous, take pictures of them for online real estate listing photos. Prospective buyers will be excited to see a home with great closets. See photographing your staged home for tips on taking beautiful photos for your online gallery pictures.